At the outset of his long, ever-evolving career as a dramatist, Edward Albee was an American heir to the intellectual energies of the European Theater of the Absurd. 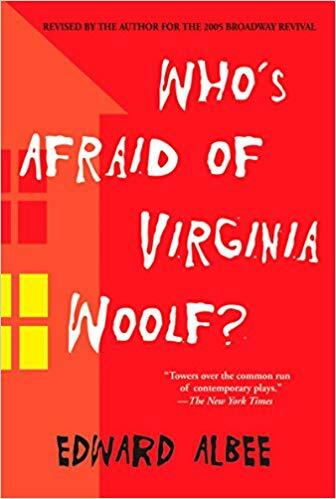 In Who’s Afraid of Virginia Woolf?, first staged in 1962, Albee moved his ferocity out of the absurd into a more realistic setting, a faculty home in which an embittered husband and wife unleash their demons with a venomous urgency that spotlights the disturbing characteristics of the author’s vision of family pathology. It’s like Albee has staged The Bacchae in our living room: We see the violence that simmers beneath the veneer of our lives erupt among familiar furnishings. This is a gut shot of a play, one that lets viewers in on the dark underbelly of marriage. The dialogue is so sharp, and the tension keeps building until you're about to pass out from holding your breath the entire time of reading. Gripping examination of a toxic marriage held together by a dream that diverged. I'll read or watch anything by Albee and this play may be always be the pinnacle of his achievements. Belongs on the list with Tennessee Williams, Eugene O'Neill, Beckett, etc. The play exposes some deep truths about marriage and reveals the emotional cost of trying to maintain lies.